Hilarious. Have a quick look at this article, and see how far one has to read into it to discover that it's really about a mission to fly by two planets and not just one. 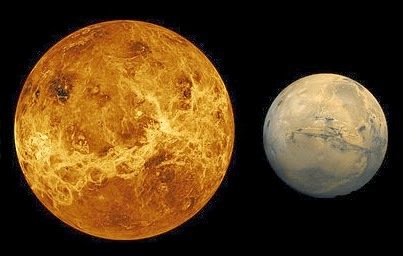 Let's take a look at all the instances of the word Mars compared to Venus. Mars would be big in the window for around 40 hours, as they whiz past the planet, ahead of a free trajectory return to Earth. In terms of window time, the puny Mars will be much shorter. Putting the two side by side shows the stark difference between the two. There is no scenario where a Mars flyby does happen and the Venus one doesn't. Don't get me wrong, I love Mars as much as any other planet of its type. But to pretend that a planet over 7 times more massive than Mars isn't even part of the picture makes no sense at all.